On day 1 in Kiev, after visiting St. Andrew, St. Michael and St. Sophia, we thought we could get a break from all the religious Kiev. The time had come to go see Maidan Square, Kiev’s most important square. After all, it had been our primary goal since the moment we’d left the hostel in the morning. Being an Interpreting student working with Russian between 2013 and 2014 meant (also) following closely the unfolding of the events in Ukraine, from the day then president Yanukovych refused to sign the Association Agreement with the EU (due on 28 November 2013), thus triggering the ‘Euromaidan reaction’, to the day many newspapers and news channels felt they could just stop talking about the war, as if nothing was happening anymore and a bunch of lines in the corner of the page was enough to provide the latest updates. And this partly explains why Maidan couldn’t not be our primary destination in Kiev. 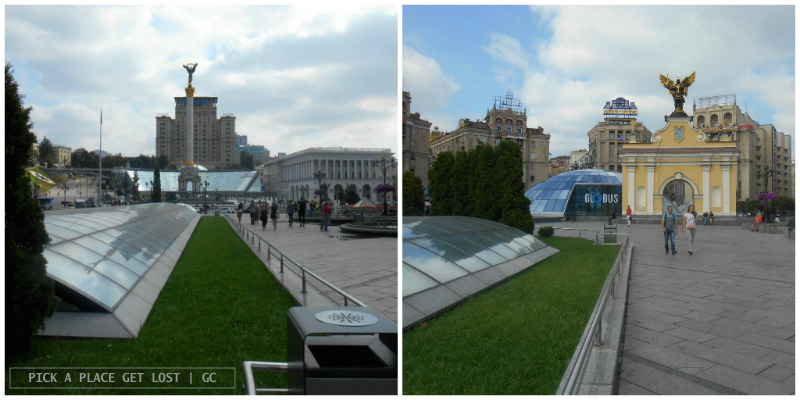 If you reach Maidan from Mala Zhytomyrska (Мала Житомирська вулиця) or Sofiivska Street (Софіївська вулиця), you will notice that the street goes downhill as you get closer to the square, which then opens up in front of you like an amphitheatre. Though actually called Independence Square (Майдан Незалежності), the square is usually known as Maidan, which is the Ukrainian word for ‘square’. Which qualifies Maidan as ‘The Square’ by definition. And it’s huge, so much so that you can hardly embrace it all in one glance. 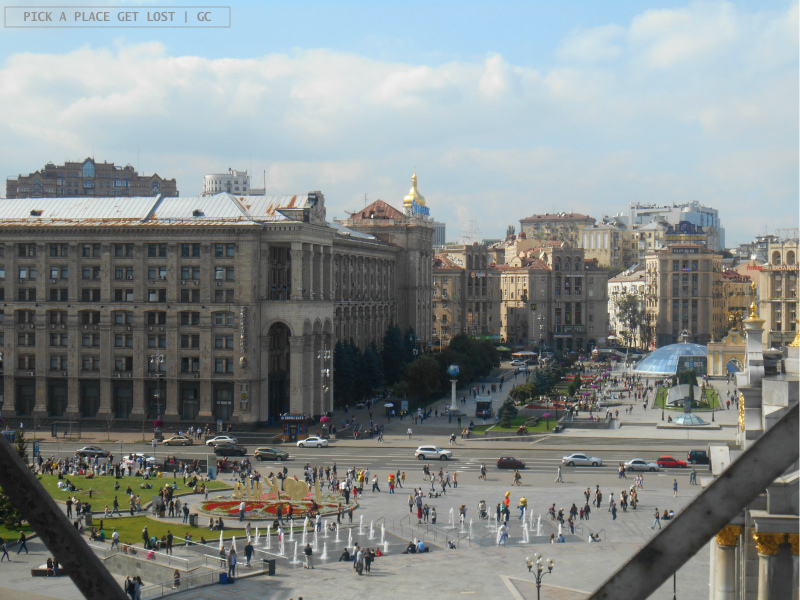 It takes a while to take in all the bits and pieces that make up the square: shops and kiosks, the staircases leading to Maidan metro station and the Globus underground shopping centre, fountains (some of which play music), the central Post Office, and other elegant, tall buildings all around the square. Last but not least, there’s Lach (or Lyadsky) Gates (Лядські ворота). The yellow arch was placed there in 2001 to commemorate one of the city gates from the Middle Ages. The gate is surmounted by a statue of the Archangel Michael, who also happens to be one of the symbols of the city itself. Khreshchatyk Street (Хрещатик), one of Kiev’s high streets, cuts right through Maidan, but there is more of the square across the street. In fact, that’s where the beating heart of Maidan lies. That side of the square is dominated by the Independence monument, a tall column surmounted by a statue of Berehynia, Slavic goddess identifiable with Mother Earth. The area around the monument was occupied and barricaded by protesters between late 2013 and early 2014, and is where most demonstrations against Yanukovych and the government originated from. Next to the column sits the monument to the Founders of Kiev, also a fountain, while the building looming over at that end of the square is the Ukraina Hotel (Готель Україна), one of the buildings where snipers would shoot the protesters from. If you’re standing in front of the column with Lyadsky Gates behind you, on the left-hand side of the square you will notice a street that goes uphill. Formerly called Institutska, the street is now officially known as Nebesnaya Sotnya (Небесна сотня), literally Street of ‘Heavenly Hundred Heroes’. The order by the same name (Орден Героїв Небесної Сотні) was established in 2014 to defend the democracy, freedom and independence of Ukraine during the Euromaidan protests (as the Ukraine protests were known). The order is named after the number of Euromaidan participants that were killed during the protests. In fact, the tombstones of the victims are lined up by the pavement and, alongside the panels placed here and there in the square, they contribute to a better understanding of what really happened, while also providing a poignant, painful reminder of the implications of the dramatic events that took place. Not that one could ever forget anything about it. 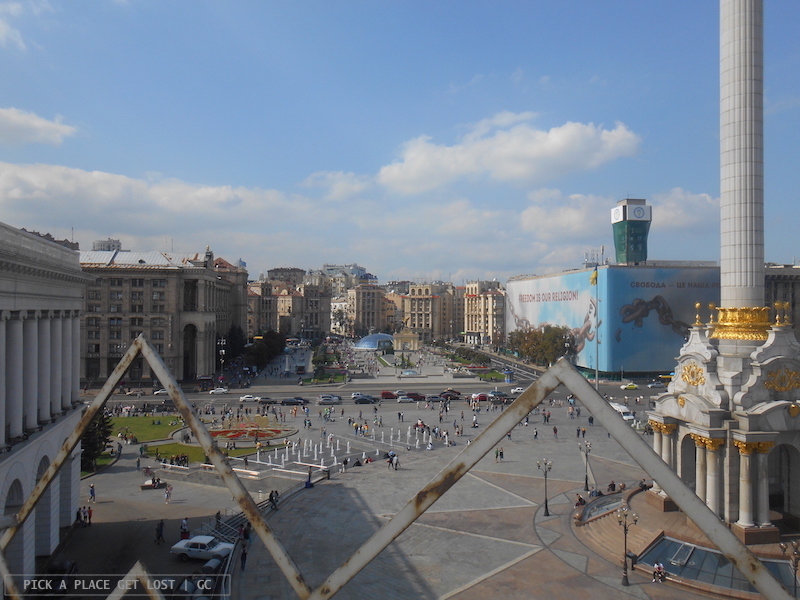 Take the Trade Unions building, the huge building overlooking Khreschatyk on the left-hand corner of Maidan. During Euromaidan it became the HQ of the demonstrators. It was then burned down in February 2014, at the height of the protests. While it’s still under renovation, it is wrapped in a huge banner that covers the whole facade. 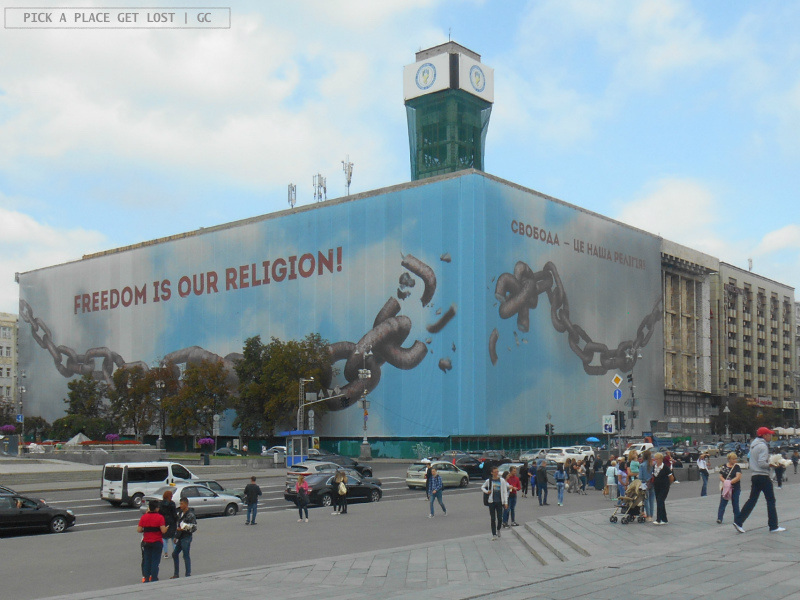 It depicts a giant chain, and the slogan on it reads: ‘Our Freedom Is Our Religion – Свобода це наша релiгiя’. 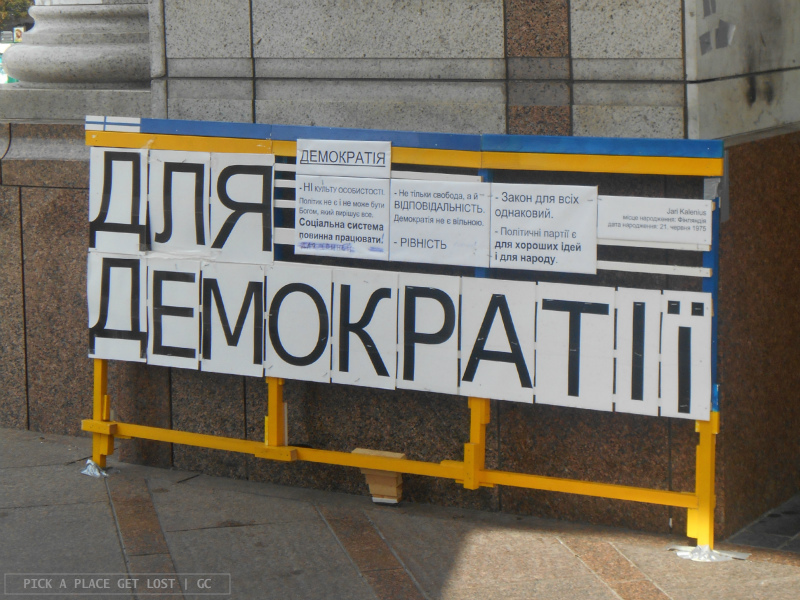 Overall, the Euromaidan events are still too recent for the whole Maidan area to not still bear its signs. 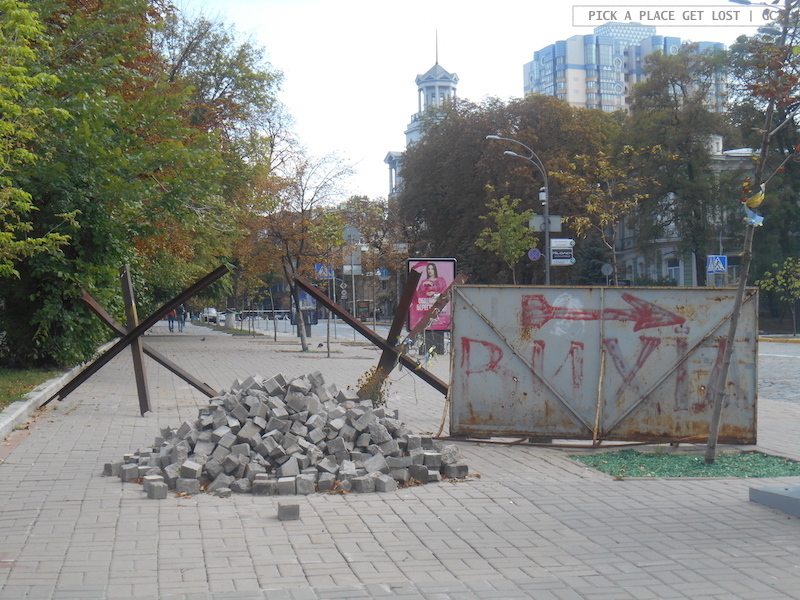 There are the remains of the barricades on Heroyiv Nebesnoyi Sotni Alley, which make it kind of contradictory to see tourists taking selfies in front of the huge ‘I <3 Kyiv’ sign on the square and, a few metres away, leftovers of the battlefield. Makes you wonder whether they just happened to be left behind or they were intentionally left there because ‘you never know’. 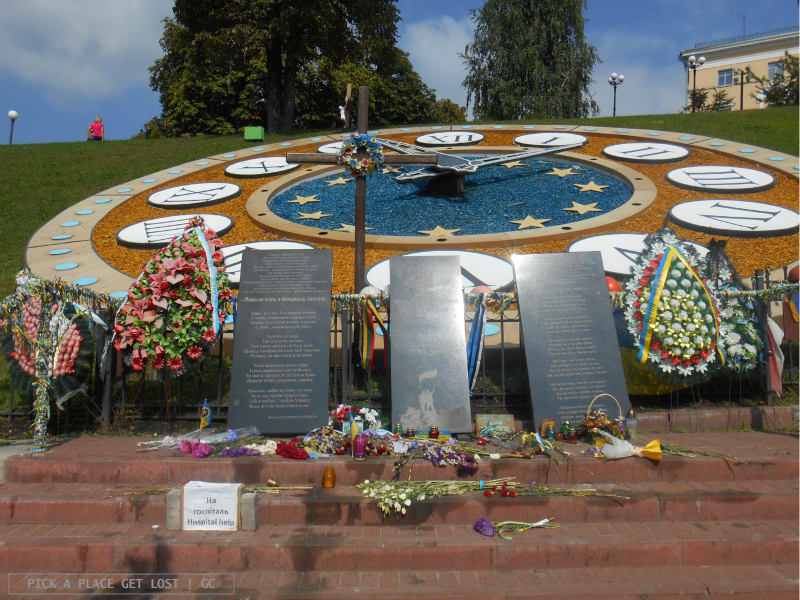 The covered area at the base of the Independence column is loaded with posters, slogans, flowers and ribbons that partly celebrate democracy and partly commemorate Ukrainian singer, writer and TV presenter Andriy ‘Kuzma’ Kuzmenko. He died in a car accident on 2 February 2015, but in 2014 he’d heavily criticised the Ukrainian government. He’d also recorded a song about the Maidan events. 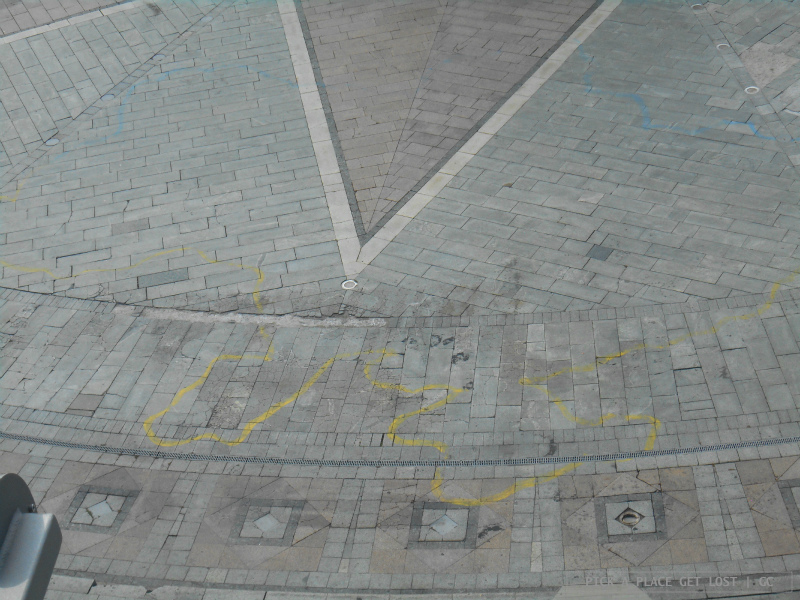 Painted in blue and yellow on the ground, right next to the column, there’s also the outline of a map of Ukraine. It’s hardly distinguishable from above, blurred as it is by the passing of time and the crowd of people that walked, marched and fought on the square – but it’s there. And on Heroyiv Nebesnoyi Sotni Alley there’s another monument, also erected in memory of the Maidan victims. 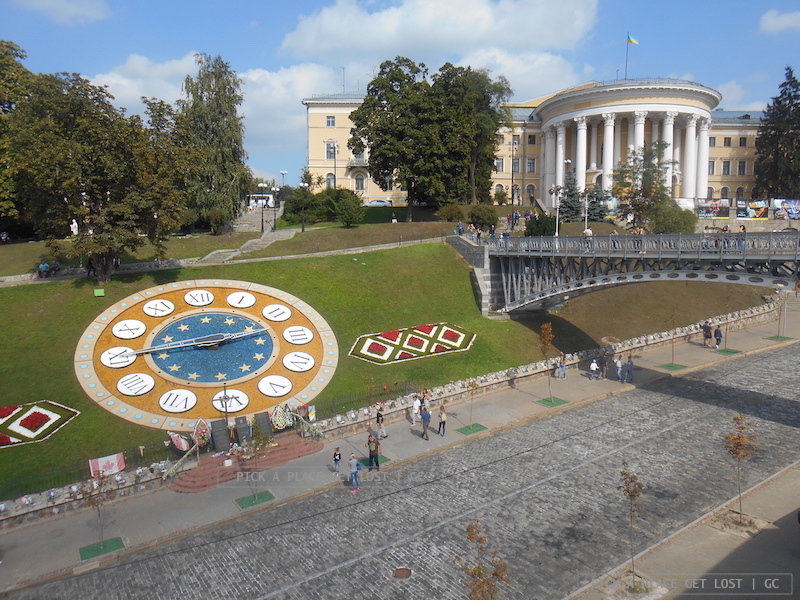 And, if you look at the ground, again, even round the base of the trees you will see the colours of the Ukrainian flag. As history proved, the Euromaidan events were not without short-and long-term consequences, of which two were (and still are) especially profound and far-reaching: the annexation of Crimea by the Russian Federation and the war in Eastern Ukraine. I won’t be dwelling on either of them here in the blog: there’d be a lot more to say and write, and the links provided are much better than me at describing in greater detail what has been going on. Allow me a final remark, though, to say how truly poignant the ‘Maidan experience’ was. Maidan is the place where the echoes of the winter 2013-2014 still ring loud and clear all over the square, and where the ‘relics’ of what was speak for themselves. Which also goes to show that, as with most things, seeing something with your own eyes takes that something to a whole new, incomparably insightful, level. 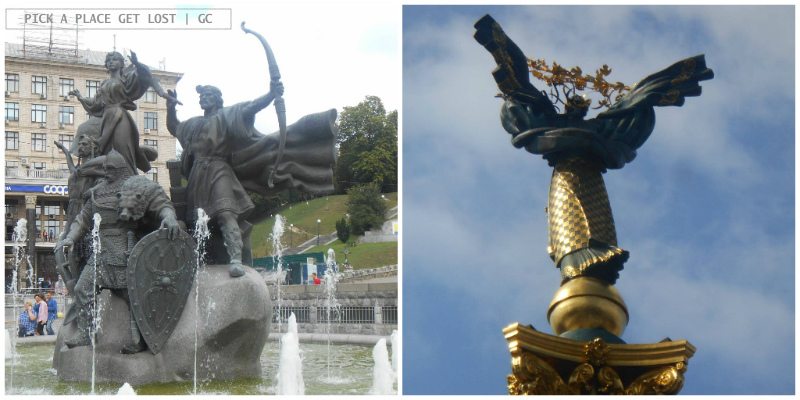 More about must-see Kiev sights in the next post about the Ukrainian capital. Soon! 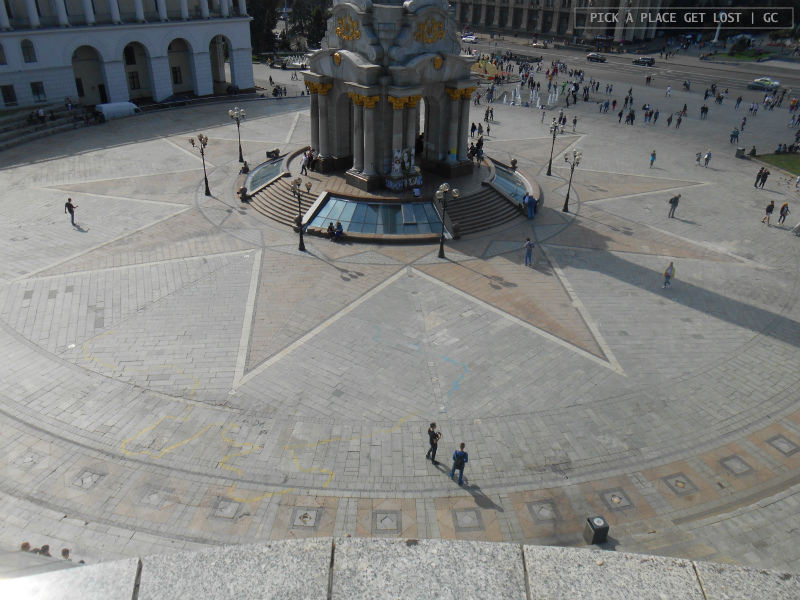 This entry was posted in Ukraine, Ukraine 2017 and tagged euromaidan, kiev, kiev independence square, maidan, ukraine, ukraine tour by Giorgia. Bookmark the permalink.